One of the advantages of camping in the bush is that we get to examine a wide range of creatures up close. We’ve been surprised that there aren’t more large animals around. 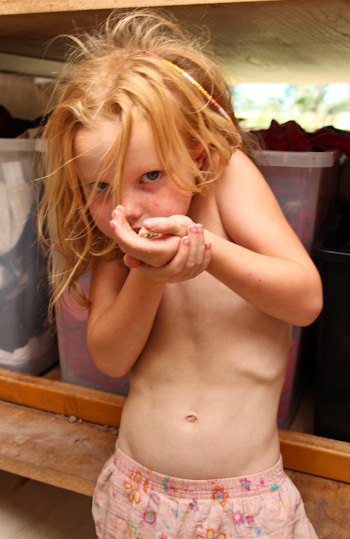 Only a couple kangaroos, wallabies, possums and one goanna have ventured into the Rainbow Gathering camp-site. 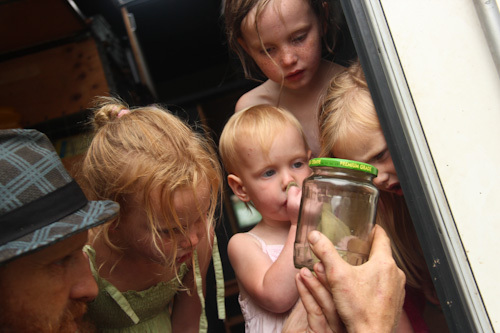 However, we’ve found a host of smaller insects and creepy-crawlies to keep our girls enthused. 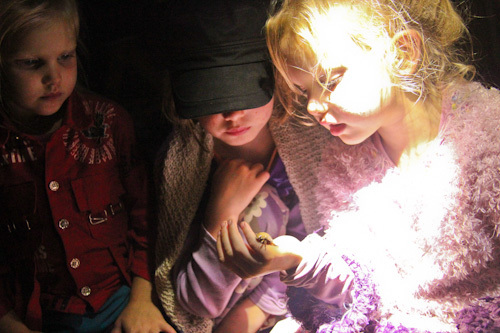 The light from our torches or lantern attracts many interesting beetles at night, and we can occasionally hold on to one long enough to show the girls. 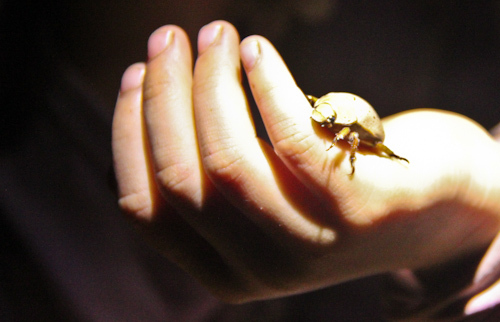 This golden Christmas beetle is very tame — it doesn't mind being handled — but it tends to fly off without notice. 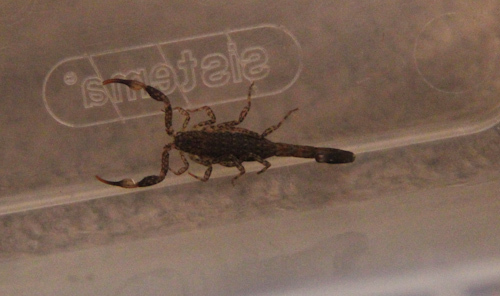 This little forest scorpion has a nasty sting, but it doesn't do as much damage as its overseas cousins. We put the scorpion into a glass jar before presenting it to the girls for their inspection. Brioni is our insect-lover and will willingly hold almost anything that crawls close enough to her to pick up. 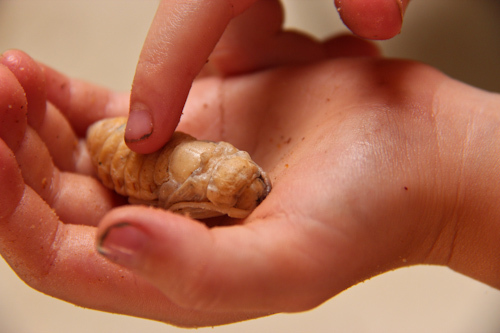 She found a large, white larvae in the mud under our trailer. I haven't been able to identify this pupa or larva — it crawled out of the mud after days of rain. David managed to catch this little skink to take to Brioni. She held it gently for a couple hours before letting it go again. As you can see, Brioni is our own little Bindi Irwin, so she’s the first we call when we find an interesting creature within examining range. It’s been a pleasure to show her how to care for insects, and now she no longer tries to keep creepy-crawlies in jars. 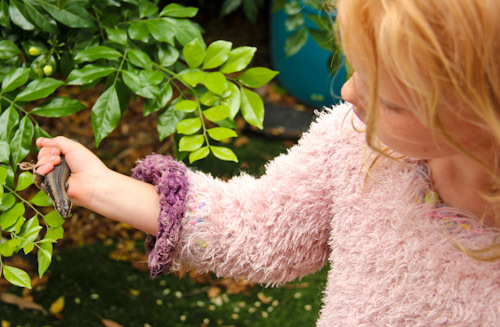 Instead, she designates a tree or bush and “collects” all her creatures there, carefully transferring them to the leaves or trunk so she can look for them later. It's fun to get messy! Right?